‘Rival Clans Push Nation to Verge of Failed State!’ Given the events of the past few months, if such a hypothetical headline were applied to the United States, it would be hard to argue with the portrayal. In one of the most amusing articles to appear surrounding the two-week shutdown of the American government in October, journalist Joshua Keating covered Washington using the condescending tropes that the US press usually reserves for its reporting on the Global South. 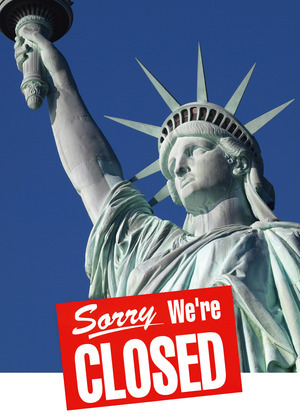 Despite offering an opportunity to skewer exceptionalist arrogance, the shutdown was not a good thing. It did, however, provide some illuminating lessons in US politics. One concerned the priorities of superpower. As the shutdown commenced, US lawmakers exempted those government services they deemed ‘essential’. In so doing, they brought their biases into ugly relief. Early education programmes for at-risk kids, shelters for victims of domestic abuse, and nutrition supplements for infants born into poverty were all cut off. Yet two Congressional gyms – with exclusive swimming pools, saunas, and paddleball courts for the politicians who caused the crisis – remained operational. Only towel service was suspended. Some have suggested that the shuttering of the federal government should have been a utopian fantasy come true for anarchists, including those who helped establish Occupy encampments. In fact, it presented a vision of the state at its meanest. National Security Agency surveillance and Pentagon drone deployments did not miss a beat during the Washington standoff – a reminder that, even if we are regularly disgusted with the government, we ignore at our peril the debate over its shape and activity. A second lesson was that big business’ manipulation of political life is often not as neat as critics imagine. The Tea Party-identified leaders of the shutdown hail from the South and are protected by electoral districts that were drawn to remain white and conservative. Their willingness to jeopardize the US bond market and their xenophobic stances on issues such as immigration put them at odds with traditional, Wall Street-cosy power brokers. The result has been a curious divide. ‘How did corporate America lose control of the Republican Party?’ asked The New York Times in September. The truth is that various tensions – regional splits, schisms between corporate élites and cultural conservatives, and even conflicts between different sectors of the business community – surface periodically. Since the 1990s, neoliberal Democrats have leapt at the chance to woo moneyed supporters by ever more fervently embracing ‘free market’ fundamentalism while retaining a vestige of social liberalism. For those who oppose rule by the rich altogether, that’s hardly a heartening development. Yet splits on the right can sometimes bear unexpected fruit. The neoconservatives of the George W Bush administration were driven more by dreams of US imperial greatness than by short-term business considerations. The likes of Halliburton and Lockheed Martin were happy to go along. But, after an invasion of Iraq that was massively unpopular across the globe, McDonald’s, Coca-Cola, and other purveyors of US consumer goods worried that ‘Brand America’ was taking an unprofitable hit. By Bush’s second term, such corporate discontent helped antiwar sentiment reach into unexpected quarters. In the case of the Tea Party extremists versus Wall Street ‘moderates’, it’s hard to tell whom to root for. Yet a divided enemy is weaker than a united one, and the post-shutdown moment offers an intriguing possibility: that someone will yet figure out how to put one rival clan or the other into the accidental service of democracy.